Dryandra R.Br., Trans. Linn. Soc. London 10: 211. (1810) nom. cons. Dryandra Thunb. Nov. Gen. Pl. 60. (1783) (Euphorbiaceae Juss.) nom. rej. against Dryandra R.Br. (1810) nom. cons. 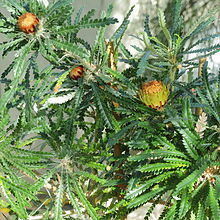 Probable synonym of Banksia - see discussion page. Brown, R. 1810. Transactions of the Linnean Society of London 10: 211. Council of Heads of Australasian Herbaria 2016. Dryandra in the APC - Australian Plant Census. Accessed 2016 Apr. 4.
International Plant Names Index. 2014. Dryandra. Published online. Accessed Oct.17 2014. Mast A.R. & Givnish T.J. 2002. Historical biogeography and the origin of stomatal distributions in Banksia and Dryandra (Proteaceae) based on their cpDNA phylogeny, American Journal of Botany 89: 1311–1323. Available on line . Accessed 2014 Oct. 17. Mast, A.R. & Thiele, K.R. 2007. The transfer of Dryandra R.Br. to Banksia L.f. (Proteaceae). Australian Systematic Botany 20(1): 63–71. doi: 10.1071/SB06016 Reference page. Thiele, K.R., Weston, P.H. & Mast, A.R. 2015. Paraphyly, modern systematics and the transfer of Dryandra into Banksia (Proteaceae): a response to George. Australian Systematic Botany 28(3): 194–202. doi: 10.1071/SB15015 Reference page. Tropicos.org 2014. Dryandra . Missouri Botanical Garden. Published on the internet. Accessed: 2014 Oct. 17. This page was last edited on 22 December 2018, at 10:49.